I sort of can't believe that I've posted two pasta recipes in the last month - especially since pasta is something I only treat myself to every once in a while. But I HAD to make this. I had to make it to see if Martha Stewart was right. Crazy challenge I know... I was watching her cooking show a few weeks ago and she made this pasta dish. She made it all in one pot and it looked so good and fresh- yet impossible at the same time. She made this pasta all in one pan and it only took about 15 minutes to make from start to finish. Like I said, it looked good, but did it taste good?? Well of course I was wrong... This is GOOD! I layered the ingredients in the pot, covered them with water and olive oil, let it boil, said a prayer, and it was perfectly cooked in about 8 1/2 minutes. The juice from the cherry tomatoes and the slight flavor from the garlic, onions and basil create the perfect light sauce. I added a little lemon zest at the end, which really brought out all of those flavors. There is no waiting for a big pot of water to boil, no cooking a sauce on the side, no standing over a hot stove for a long period of time, and there is only one pot to clean. All of that makes this a perfect summer weeknight dish. 1. 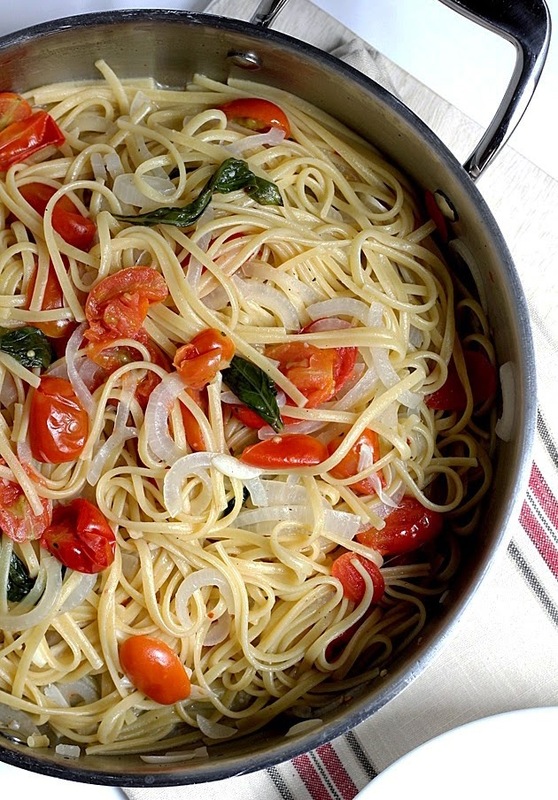 Place the linguine, cherry tomatoes, onions, garlic, red pepper flakes, basil, water, and olive oil to a large skillet with straight sides. Bring the mixture to a boil over high heat. Boil the mixture, stirring frequently with tongs to ensure that the pasta cooks evenly. 2. Boil for about 8-9 minutes or until the pasta is al dente and the water is almost all evaporated. It's easy to overcook the pasta in this dish, so keep checking it to see if it is ready. 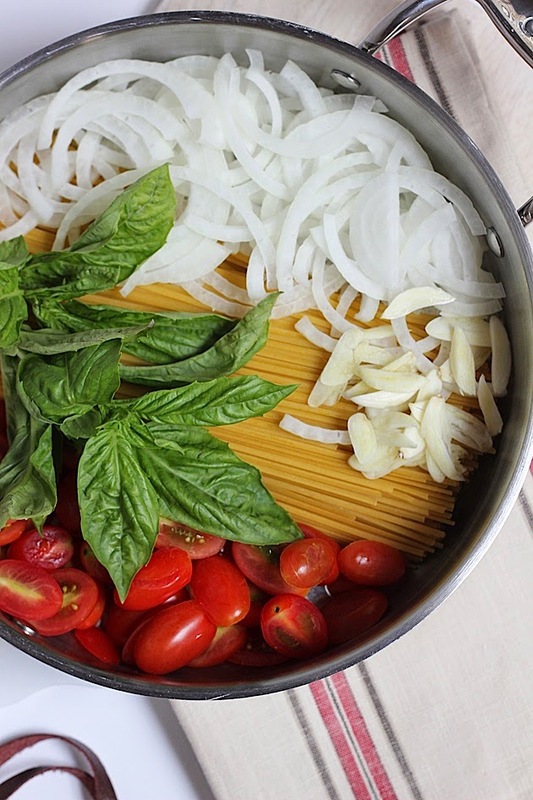 If the pasta is al dente before most of the water evaporates, then simply drain some of the water out of the skillet. The liquid is the sauce and keeps the past moist, so don't drain too much of it off! 3. Season the pasta to taste with additional salt and pepper and toss. Add each serving to a bowl. 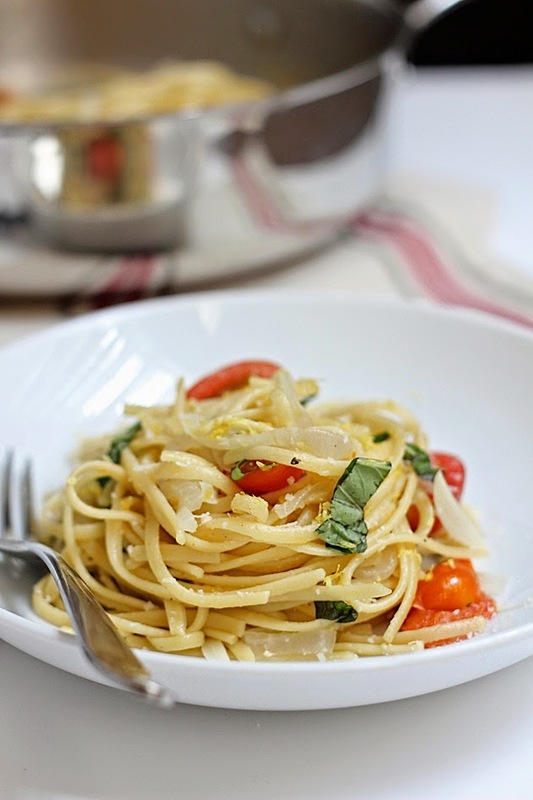 Garnish with basil, parmesan cheese, lemon zest and a drizzle of olive oil. Oh my goodness, I can smell those onions and tomatoes cooking already. I like challenges.... although you explained it so it doesn't seem so hard. I've been wanting to try one of these one skillet wonders. There are so many great pasta options now like the quinoa blend from trader joes! So so good!! I need to try this!